Online privacy concerns focus on the protection of “customer information” which a customer reasonably expects to be kept private. “Customer information” is information which can be associated with a specific individual or entity, including, for example, a customer’s name, address, telephone number, e-mail address, and information about online activities that are directly linked to them. As is common practice, we collect customer information, such as name, address, telephone number, and a variety of other information in the course of billing and providing marketing and mailing services to a customer. In the course of using our Web site and Internet services, we also automatically track certain information about your visit. This information may include the URL that you just came from (whether this URL is on our site or not), which URL you next go to (whether this URL is on our site or not), what browser you are using, and your IP address. We use this information in the normal operation of the site and we may disclose this information only on an aggregated basis. We do not use this information to identify you personally without your express consent. See information regarding cookie usage below. Certified Mail Envelopes will collect and use customer information for billing purposes, to anticipate and resolve problems with your service, or to create products and services that better meet your needs. This means that Certified Mail Envelopes may use your customer information, but we will not disclose your customer information to third parties who want to market products to you. 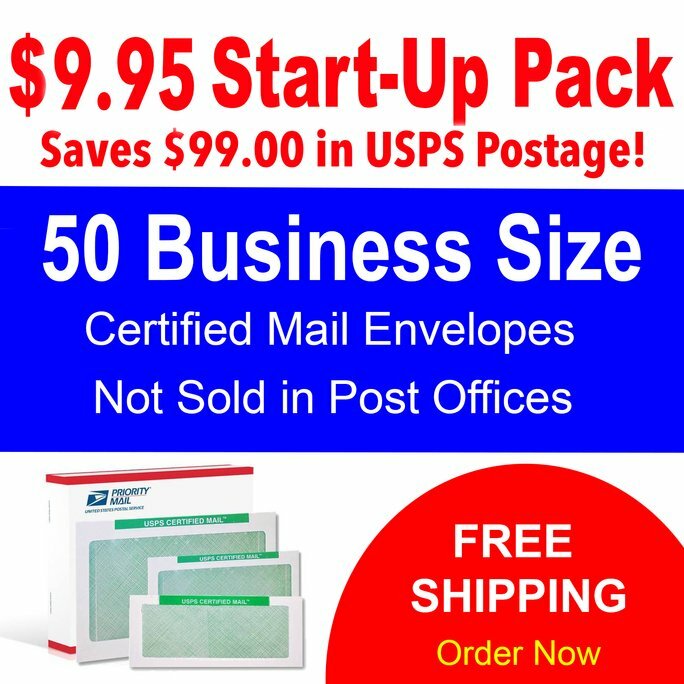 Certified Mail Envelopes may contact you from time to time by means of e-mail, postal mail or by other available means regarding the service you are registered for. Except as provided in this policy, Certified Mail Envelopes will not sell, trade, rent or disclose to third parties any customer information derived from the registration for or use of a Certified Mail Envelopes online service – including customer names and addresses — without the consent of the customer except as required by subpoena, search warrant, or other legal process or in the case of imminent physical harm to the customer or others. When Certified Mail Envelopes uses other agents, contractors or companies to perform services on its behalf, Certified Mail Envelopes will ensure that such agents, contractors or companies protect your customer information consistent with this Policy and SAS-70 Certified. You may review any of your personal information we have collected from you by contacting us at the address below. Certified Mail Envelopes will correct or delete any inaccurate information upon your request. Certified Mail Envelopes has implemented technology and security features and strict policy guidelines to safeguard the privacy of your customer information from unauthorized access or improper use, and we will continue to enhance our security procedures as new technology becomes available. Certified Mail Envelopes will not read or disclose to third parties private postal or electronic communications that are transmitted using Certified Mail Envelopes services except as required to operate the service or as otherwise authorized by law. Certified Mail Envelopes data center and production center facilities are very secure areas. Access to our data center is limited by electronic badge entry and only selected employees are granted access. Our data processing center and all production center facilities are also secured and monitored with surveillance cameras. Access to production areas is restricted to selected employees with security badges. When Certified Mail Envelopes uses other contractors or companies to perform services on its behalf, we ensure that our business partners, agents, service contractors protect your information consistent with this Policy. Certified Mail Envelopes may also use customer information to investigate and help prevent potentially unlawful activity or activity that threatens the network or otherwise violates the customer agreement for that service. Our policy addresses the use and disclosure of information we collect from you. To the extent that you enter our sites through Internet Search Engines, Internet Service Providers and disclose information on other third party sites, different rules may apply to their use or disclosure of the personal information. We encourage you to read privacy policies of all third parties to which you disclose your personal information..